I'm starting to realize that I have a problem... I can't say no to a cheap chair. I went for coffee with Paul Friday afternoon then we ended up at the Gibsons Recycling Depot. He actually went to recycle stuff. I went to check out the Share Shed there. They had some interesting stuff and it was cheap but nothing caught my eye until I saw this chair for $2... Well I HAD to get it! 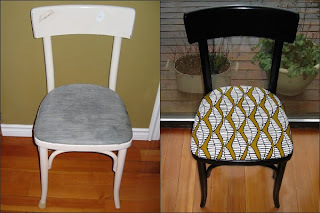 I refinished the chair yesterday and Paul reupholstered it this morning and tada - it's done! I'm not going to keep it since I, as you can imagine, have TONS of chairs. Speaking of which I'll be posting an update on my $3 oak chairs tonight or tomorrow. Maybe I should embrace this 'addiction' I have and just be 'The Rescuer of Chairs'... Pick up unwanted/unloved chairs then update them and then pass them on... Or just be some crazy lady who has a house full of chairs and no tables, etc. My wish list for this garage season is to find: a big table for the dining room, an old wood dresser, some shelves or some sort of organization system... We'll see what I can find!